Menopause literally means the “end of monthly cycles” (the end of monthly periods aka menstruation), from the Greek word pausis (cessation) and the root men- (month). A woman’s period, once every 28 days on average, starting from around 14 years (menarche) and ending at around 50 years old (menopause), is a series physiological changes for the preparation of impregnation. It involves the organs/tissues of hypothalamus, pituitary, ovary and uterus. In terminology, menopause is recognized after 12 months of amenorrhea (absence of menstruation). Perimenopause is for describing the transition from reproductive life to menopause, characterized by irregularities in menstrual cycle, with the average age of 45 to 47. The terms of menopause and postmenopause are often used interchangeably [[i], [ii]]. By the time of a girl’s menarche, there is an average of about 400,000 oocytes (eggs) in the ovary. However, by the time of menopause, only fewer than 10,000 eggs left. Furthermore, as menopause approaches, the remaining eggs become more resistant to the stimulation of follicle-stimulating hormone, and the ovaries dramatically reduce their production of a hormone called estrogen, leading the less menstrual cycle and the natural menopause eventually [[iii]]. The other causes of stopping menstruation are the pathological menopause due to the congenital or acquired hypothalamic – pituitary – ovarian axis lesions (ovarian dysgenesis, cancer, inflammation, injury, radiation, drugs, etc.) and systemic diseases (thyroid, adrenal disease, diabetes, anemia, tuberculosis and nutrition poor, etc.) that involve the axis [[iv]]. Natural menopause is a natural process along with a woman’s normal aging process, not a disease or illness. However, due to the cycle decrease of menstruation related hormones, especially estrogen, some women may have the physical and emotional symptoms since estrogen affects many parts of the body, including the blood vessels, heart, bone, breasts, uterus, urinary system, skin, and brain . 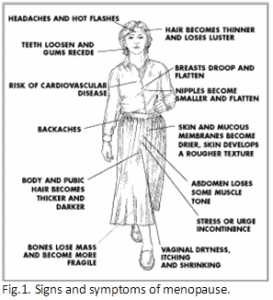 The signs and symptoms of menopause may include irregular periods, hot flashes — flushing of face and chest (may be accompanied by heart palpitations), dizziness, headaches, night sweats, cold hands and feet, vaginal dryness, insomnia, mood changes—depression, irritability, tension (usually happens with sleep problems), and gain in abdominal fat (Fig.1, [[v], [vi]]). Perimenopause is a natural stage of life for a woman. It is not a disease and therefore it may not need any medical treatment at all. However, if the symptoms are strong enough that they significantly disrupt the everyday life of the woman, palliative medical therapy may sometimes be appropriate, including hormone replacement therapy (HRT), DHEA, Antidepressants, blood pressure medicines and alternative medicines . However, due to HRT is hard to mimic the nature changes of the hormones, and actual outcomes of HRT might pose more risks than benefits, including an increased risk of breast cancer, heart disease, stroke, and blood clots . (1) Syndrome of deficiency of kidney yin: Clinical manifestations are: menstrual disorders, shortened menstrual cycles, with less or more menstrual flow than usual, dizziness, tinnitus, flushing of face, sweating, pains on waist and knee, heel pain, dry skin, dry mouth, constipation, oliguria with yellow color, red tongue with less coating, thready and rapid pulse. The general prescription is Zuo Gui Wan (左归丸) and Er Zhi Wan (二至丸). If there are dry eyes, give Qi Ju Di Huang Wan (杞菊地黄丸) with addition or subtraction; if upset and inquietude, insomnia and dreaminess, giving Bai He Di Huang Tang (百合地黄汤) or Gan Mai Da Zao Tang (甘麦大枣汤) and Huan Lian E Jiao Tang (黄连阿胶汤) with addition or subtraction. (2) Syndrome of deficiency of kidney Yang: Clinical manifestations are: more menstrual flow than usual, depression, dark complexion, lower back pain and cold, clear and abundant urine, nocturia, or swollen face and limbs, thin and white tongue coating, deep, thready and weak pulse. Prescription with You Gui Wan (右归丸) with addition or subtraction. (3) Syndrome of deficiency of kidney Yin and Yang: Clinical manifestations are: menstrual disorders, dizziness, tinnitus, forgetfulness, lower back pain and cold, pale tongue with thin coating, deep and weak pulse. General prescription is Er Xian Tang (二仙汤) and Er Zhi Wan (二至丸). The commonly used Chinese patent herbal medicines can be selected with addition or subtraction according to symptoms. If there are obvious symptoms of kidney deficiency, select the group of Di Huang Wan (地黄丸), such as Liu Wei Di Huang Wan (六味地黄丸), Qi Ju Di Huang Wan (杞菊地黄丸), Mai Wei Di Huang Wan (麦味地黄丸), Zhi Bai Di Huang Wan (知柏地黄丸), Ba Wei Di Huang Wan (八味地黄丸). If obvious with symptoms of insomnia and irritability, select the group of sedative pills, such as Zhu Sha An Shen Wan (朱砂安神丸), Bai Zi Yang Xin Wan (柏子养心丸), Tian Wang Bu Xin Dan (天王补心丹), An Shen An Zhi Wan (安神安志丸). If obvious with symptoms of depression, select the group of Jia Wei Xiao Yao San (加味逍遥散).